I had a lot of suggestions for “D”: Darjeeling Tea (actually received today, a bit late), Durian (gross), Doughnut, Dalai Lama (cocktail), Dulce de Leche, and others. I ended up with Drumstick because it seemed creative. This Drumstick is the Nestle ice cream product, not a chicken leg, just by the way. 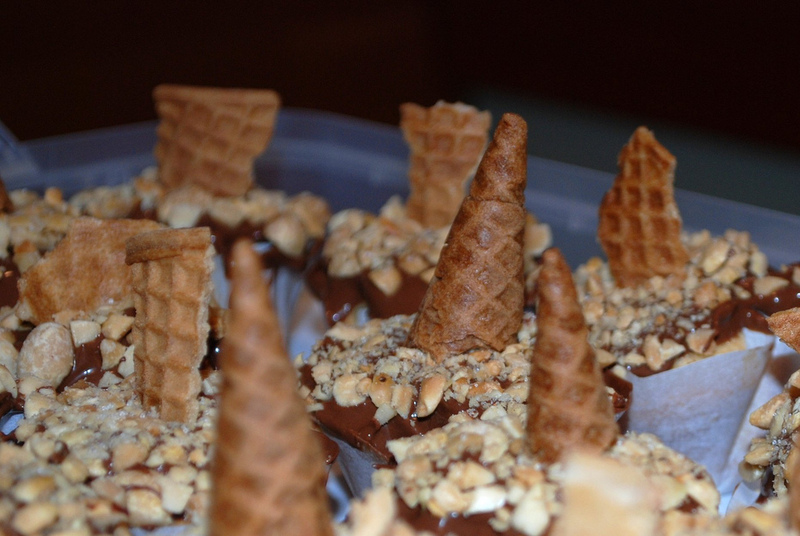 It’s a vanilla ice cream cone with a fudge center topped with milk chocolate and dipped in peanuts. Every time I’ve ever had one, it was individually wrapped and had to be unpeeled. The chocolate almost always stuck to the wrapper a bit. I started my Drumstick journey a couple of days beforehand by making the fudge center. I used a slightly modified Cooks’ Illustrated recipe for hot fudge sauce. I figured if it wasn’t hot, it would be thick, right? 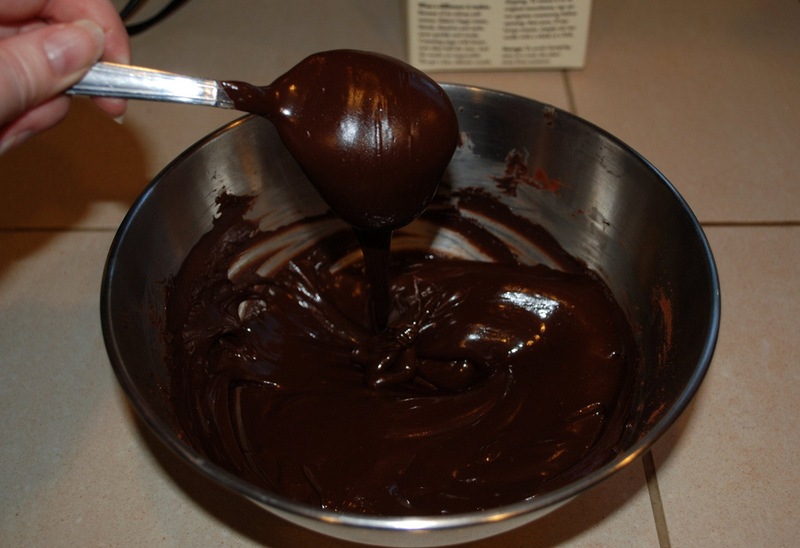 Melt chocolate in small heat-proof bowl set over pan of almost simmering water until smooth, stirring once or twice. Turn off heat and whisk in cocoa until dissolved; set aside. Warm sugar, corn syrup, cream, salt, and 1/3 cup water in medium, heavy-bottomed, nonreactive saucepan over low heat without stirring until sugar dissolves. Increase heat to medium-high; simmer mixture, stirring frequently, about 4 minutes. Turn off heat and whisk in vanilla and butter. Cool mixture slightly, about 2 minutes; whisk in melted chocolate. I kept this in the frig for a couple of days and brought it to room temperature while baking the cupcakes. So the first step of the cupcakes was the wrapper. I wanted to have the chocolate topping inside the wrapper, so I thought I would make liners out of parchment paper. I probably needed to make them a bit taller as they ended up essentially being only slightly higher than regular cupcake liners. Next step: The cone. Drumsticks have a sugar cone, which are pointy, so I couldn’t make the cupcakes in the cones. 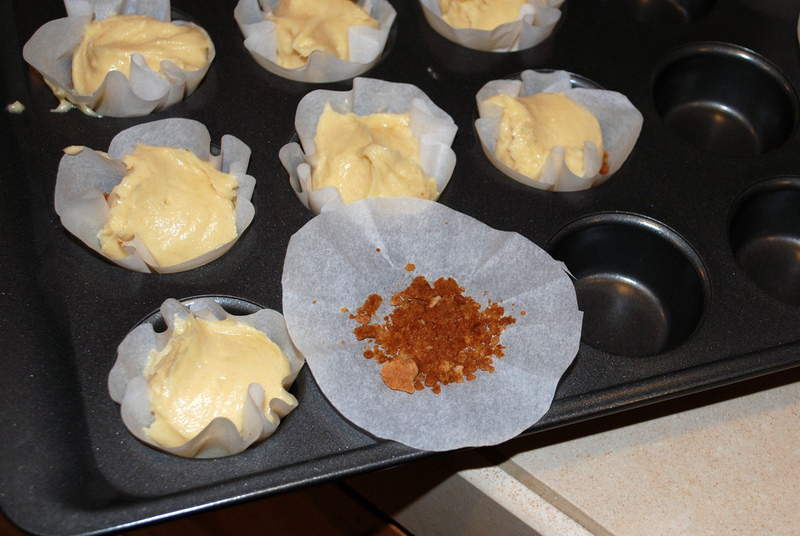 Instead I made a crust for the bottom of the cupcake by grinding up some sugar cones in the food processor and combining the crumbs with a little melted butter. I put a small amount on each parchment paper and pressed it down with a utensil (a prescription vial in a ziplock….it was the perfect size to mush the paper down into the mini cupcake pan) then baked them for about 5 minutes at 350 degrees. 3rd step: Making the cupcakes. I used the New Best Recipe Yellow Cupcake recipe, emailed to me by a coworker. Whisk together dry ingredients in bowl of stand mixer. Dump in the rest of the ingredients. (Odd, I know!) Beat until smooth and satiny, then put into cupcake tins. Cupcakes before baking: click to enlarge. I set the timer for 16 minutes since I was making minis. When I checked them, they didn’t seem done, so I put them back for another 2-3 minutes. Probably wasn’t a good idea as I think they got a little overcooked. So after the cupcakes cooled. I moved on to step 3 (?? I lost count). I filled a decorating bag with what I thought was softened fudge. After trying to squeeze a hard mass of chocolate out of a tiny tip, I realized it wasn’t soft enough. I put the whole bag into a ziplock and soaked it in some warm water for a bit. It softened up enough to fill the cupcakes, but not before exploding all over me. Very attractive. I tried to get Mr Shuck to take a photo, but he thought it was too disgusting. After filling, I melted some milk chocolate chips and crushed some dry roasted peanuts. 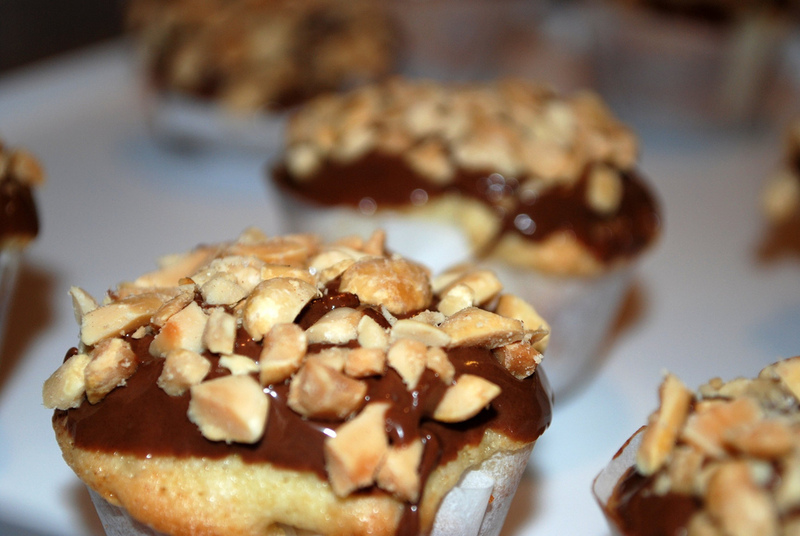 I dipped each cupcake in the chocolate, then into the peanuts. Almost finished! Click to enlarge. I broke some of the other sugar cones for a garnish. I think they were a success, even though the cake was a bit dry. The only problem with the mini’s and a cupcake like this with multi-flavors going on, is that there isn’t a lot of cake to really get a taste of. (Although in this case that was maybe best). The fudge was amazing. Loved the chocolate and peanut top. The cake was fine, I thought, and I liked the crushed cone on the bottom because the different textures are always a pleasure. (Although I have a feeling your crown may tilt a bit after E).